The user interface also looks pretty much cool. You have a small login window which looks as it is in Gmail. Chats will open in tabs in main window which I didnt like that much. I could not find any option to pop out the chat tab from main window. 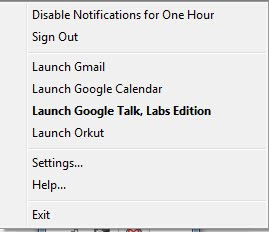 The tray menu has individual options for launching Gmail,Calendar and Orkut. Strange thing I found is that I dont have many options when it comes to settings. The only option that we have are for enabling notifications and for making Gmail as default client. haha I didnt observe it :O ...Probably Google feels more confident on Auto Inbox check..